MISSOULA – Lake County is one of 16 counties in Montana that does not produce conventional energy resources – coal, natural gas or oil — but that doesn’t mean plummeting gas prices won’t have some impact locally. 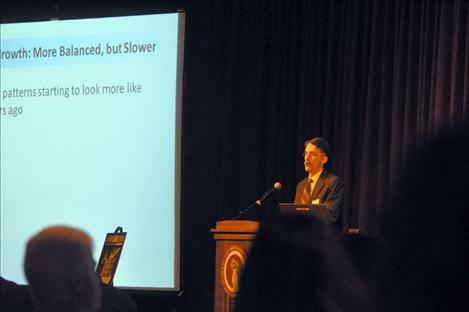 Economists and experts gathered at the University of Montana for the 40th annual Economic Outlook Seminar said the impact of the drilling slow down could likely have mixed-result, trickle-down impacts on other industries in the state, like tourism. Aside from the oil crash, the national economy has been growing, with encouraging growth in small business, Barkley said. The United States economy is strengthening as foreign countries are starting to feel an economic pinch. In Montana, wages have crept upward slowly since the recession statewide, with the exception of counties near the Bakken, where a boom in oil production has caused wages and number of workers to skyrocket. As global prices fall, the impact nationwide and in Montana could be substantial. Barkley said impacts to energy investment will likely first be seen in mid-2015. Support service industries in Billings and Glendive might also be hard-hit. “The pain is going to be felt beyond the areas where drilling takes place,” Barkley said. The downturn led Barkley to reign in his economic outlook for 2015, and said that while statewide growth is still likely, it will be a bit slower. Oilfield worker Darren Gunlock of Polson said he can see things in the Bakken are slowing down. Gunlock said the layoffs are unfortunate, but it might also be beneficial. “It will give these oil companies time to catch their breath, get their feet back on the ground and figure out what they have got to do to make a profit and weather this storm,” Gunlock said. Gunlock’s employer has cut back on worker’s hours, so more people can keep their jobs. Gunlock said many in the business have been going nonstop for years, and it might be nice to take a breather. While low prices might hurt the oilfield and other industries, it could be a boon for another major industry that drives the state economy: tourism. In 2014, when gas prices were almost double what they are today, tourism was relatively flat, although Glacier National Park and Yellowstone National Park had record-high numbers of visitors. The University of Montana Institute for Tourism and Recreation Research predicts the state will see a 2 percent increase in numbers of travelers throughout 2014. In 2014, non-resident spending contributed more than $26 million to Lake County. Sandy Coulter said more tourism is good for her family’s gas station which lies in the heart of Charlo. The tiny station is along the route to the National Bison Range, but other than that, it sees little traffic. An uptick in travelers heading out to see the mighty bovines could be a boon for business. “It really does help,” Coulter said. Allard’s station manager Ty Hagan was not as sure the price decrease would have a huge impact this summer, because so many factors influence prices. He said he has not seen much impact since the prices have dropped. In his experience, people traveling Highway 93 are going to stop for gas regardless of price. “Being as we’re on the highway, if you need it you are going to pay,” Hagan said.